Below are the classes for 5-7 year-olds. The easiest way to fill out the Registration form is to check out the class descriptions on this page, choose the one(s) you would like to register your child for, and click the red button. When you land on the Form page, find the box that corresponds to the class and "check it". We will know, by your child's age on the form, where to reserve a space. Now the excitement really begins as your child embarks on a full year program offering weekly 45-minute classes from September to May. The start of the year the student continues where they left off in KinderMoves, participating in all the fun and familiar activities that made them love to move. We gradually increase the complexity of movement and duration. 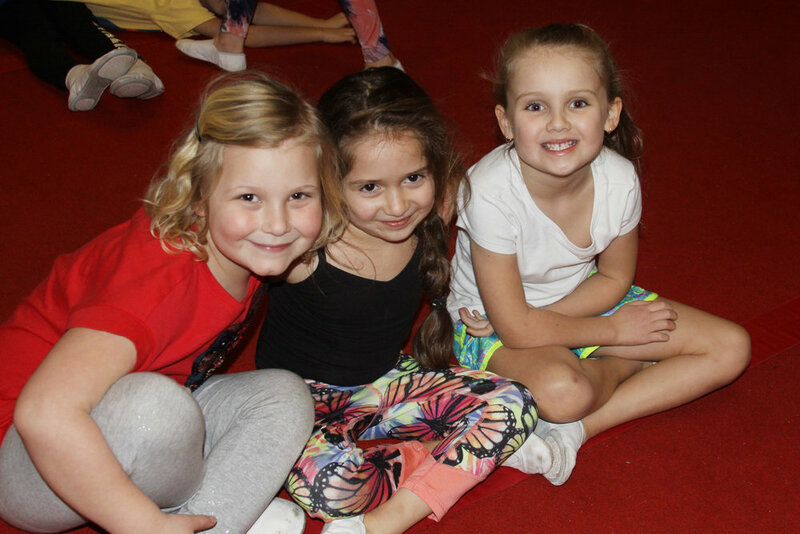 The second half of the year we will work together to create a dance/gymnastics routine that will ensure a successful performance for your child’s first dance recital. This is super exciting with the sparkly costume, group pictures, dress rehearsals and the show. Prerequisite: We recommend students participate in two sessions or more of KinderMoves prior to enrolling in KinderKicks. Those who attend two sessions of KinderMoves will have priority in reserving a space in the class. Dress Code: Students are to wear leotard and tights or warm up suit. All students will need to purchase white gymnastics shoes ($22) which can be done at our open house. Long hair should be pulled back and jewelry is prohibited. Please encourage your little dancer to get a drink and use the restroom before class so that we can maximize our time together. Our Tutu Cute Ballet class is perfect for ages 4-6. Does your child love to dress up, twirl and be in a sea of pink? Your child will be nurtured by the bonds she establishes with her teacher and her assistants, as well as with the other girls in her class. This class sets the foundation for our upper level dance lessons such as ballet, jazz, tap, acro and more. Everything from rhythm, etiquette, focus, manner, French terminology, dances and more are covered leading up to the May recital when the 4-6-year old’s dazzle the audience with their charm and talent. Dress Code: Students will need to wear pink tights and a leotard with a skirt. Pink ballet shoes are required and are available at the studio. Students can be sized at the open house or anytime before or after class. The cost of ballet shoes is $35. Hair should be worn in a pony tail or bun. Gymnastics is one of the best choices you can make for a young child. Did you know that gymnastics develops 26 multiple intelligence factors in children? The benefits are tremendous. It’s an “all body” sport that develops muscle memory, strength, flexibility, balance, coordination and much more. Students learn our gymnastics class format, physical conditioning, skill progressions and development. Our curriculum is action packed, time tested and effective. Every warm up, drill or method has a specific goal. Our instructors carefully breakdown new skills so students can practice safely. Each student will learn from group and individual instruction . Our experienced and trained instructors will demonstrate and spot students to enhance maximum success. We remind parents that students progress on his/ her own time table. Please do not compare your child’s ability or progress to other students. Each child progresses due to several factors like, age, experience, body readiness and practice. Keep in touch with your child’s feelings about the classes, are they having fun, being inspired by the instructors, enjoying their peers? Though our classes are for students only we invite parents to communicate with us anytime about their child’s progress. Tap dance is a form of dance characterized by using the sounds of tap shoes striking the floor as a form of percussion. Students will learn basic tap skills and combinations that can progress with time and practice. Tap is a fun and energetic class and works well for students who enjoy moving a lot. Tap can enhance student’s rhythmic abilities and benefit them in future dance classes. This is the perfect class for young students to begin learning the foundation of dance skills and terminology. Each class breaks down technical skills like, jumps, turns and leaps. Students will learn across the floor dance patterns that will gradually increase in complexity and intensity. 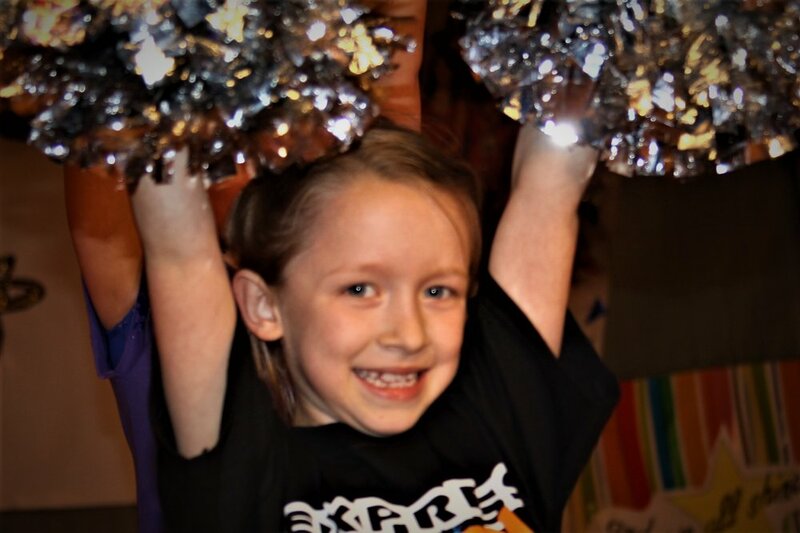 Performance and showmanship will be encouraged with the use of pom poms. Our jazz movement goals are easily achieved as our dancers enjoy the stimulating and visual effects of shinning, sparkling pom poms. This fun element really enhances showmanship and fun. Other areas of development include awareness of formations, spacing and synchronization. The fundamentals of this class helps students be prepared for just about any future dance genre. Pom Poms will be provided and are property of the studio. [ Ages 5-18] | Our curriculum is action packed, time tested and effective. Every warm up, drill or method has a specific goal. Our instructors carefully breakdown new skills so students can practice safely. Each student will learn from group and individual instruction. Our experienced and trained instructors will demonstrate and spot students to enhance maximum success. We remind parents that students’ progress on his/ her own time table. Please do not compare your child’s ability or progress to other students. Each child progresses due to several factors like, age, experience, body readiness and practice. Keep in touch with your child’s feelings about the classes, are they having fun, being inspired by the instructors, enjoying their peers? Though our classes are for students only we invite parents to communicate with us anytime about their child’s progress.